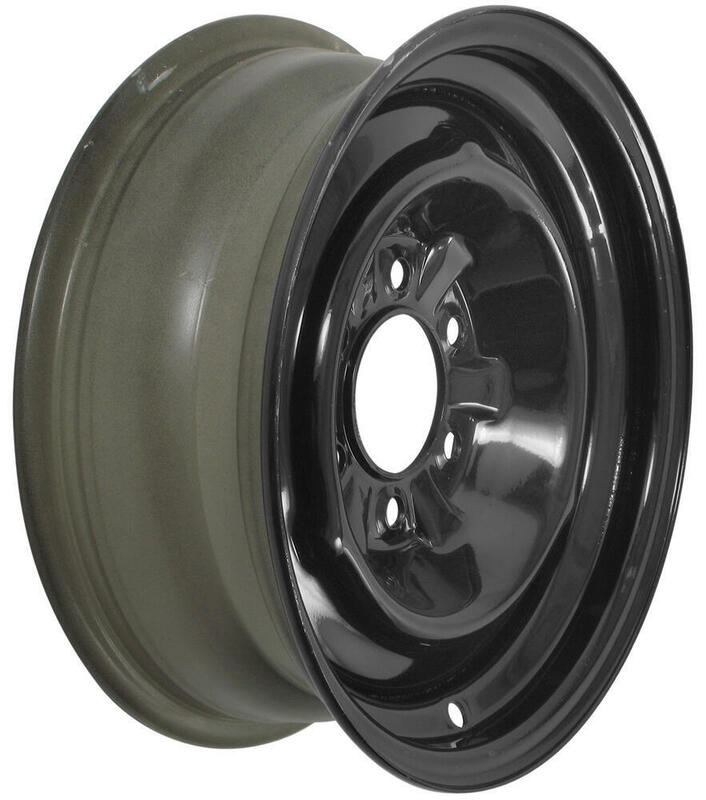 Black powder coated, 16" steel trailer wheel features a 6 on 5-1/2 bolt pattern and meets Department of Transportation standards. Lowest Prices for the best tires and wheels from Dexstar. Dexstar Conventional Steel Wheel - 16" x 6" Rim - 6 on 5-1/2 - Black Powder Coat part number AM20758 can be ordered online at etrailer.com or call 800-298-8924 for expert service. 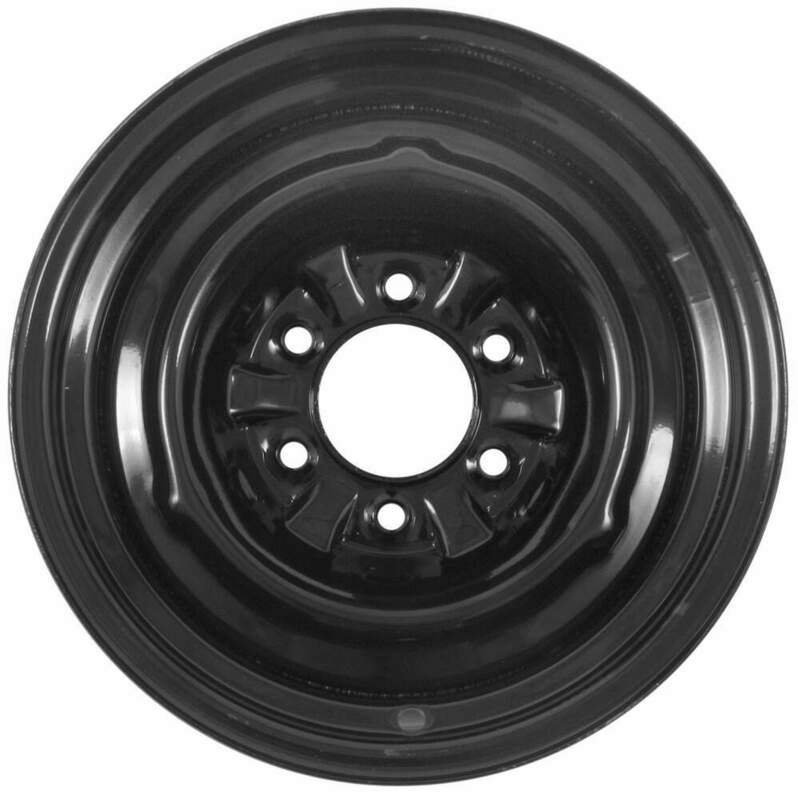 20758DX Dexstar Conventional Black Steel Wheel - 16"
Corrosion-resistant, 16" steel wheel features a 6 on 5-1/2 bolt pattern and meets Department of Transportation standards. Today we're going to review Part Number AM20758. 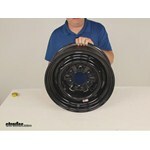 This is the Dexstar 16" x 6" conventional steel wheel, has the 6 on 5 1/2" bolt pattern. This wheel is made of a sturdy steel construction. It has the nice black powder coat finish that they put over an E-coat primer over the whole wheel, front and back. This gives you excellent corrosion resistance. Now this wheel is the conventional design. It does not have any spokes. Basically the design of this wheel is used on a lot of automobiles. It has the design to where it accepts a hubcap. This is a high quality wheel that meets the Department of Transportation specifications. The rim dimension on this is 16" in diameter and 6" in width, and the way you go to measure that on any wheel, when you go to measure it, you're actually measuring the bead seat to the bead seat, so it's inside to inside. You don't want to measure the outside to outside. Basically when a tire is mounted on this, the tire would mount right here, the bead seats of the tire would mount here, so that's what you'd be measuring. So if we go inside to inside, you can see it's 16" in diameter. And if we measure the width of the wheel, again bead seat to bead seat, so inside to inside. As you can see we put a rule on it, it's going to be 6". So 16" in diameter, 6" in width. The bolt pattern again, you can see it's six lugs on a 5-1/2" bolt pattern, and basically if you're going to measure the bolt pattern on a wheel with even number of lugs, it's pretty simple to measure. Basically, you just pick one of the lug holes, and you'll measure from the center of that lug hole directly across to the center of the hole right across from it. So basically, I'm going to pick this hole to this hole. So if we put a ruler on center to center, you can see 5-1/2". So 6 lugs, 5-1/2" bolt pattern. Now the wheel lug size that this wheel uses is 1/2" x 20. The pilot hub diameter, which is this large hole in the center of the wheel, fits over the hub on the trailer. We'll measure the diameter of that hole is going to be 3.65" for the pilot hub diameter, and the weight capacity on this wheel is 3,050 pounds. 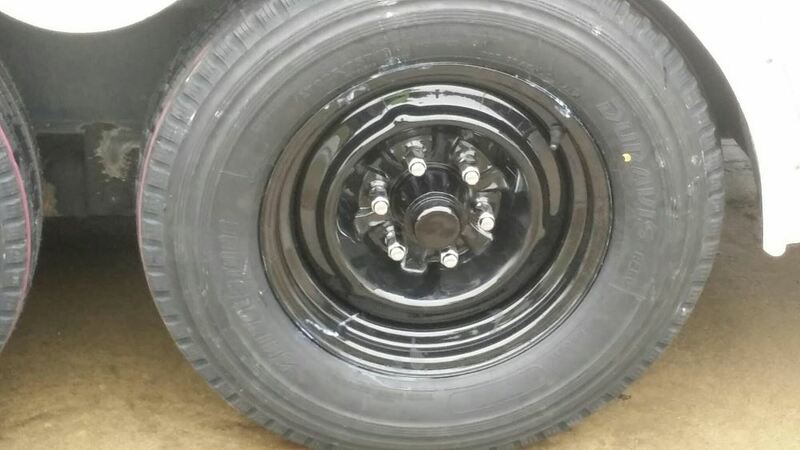 But that should do it for the review of Part Number AM20758, the Dexstar 16" x 6" conventional steel wheel with the 6 on 5-1/2" bolt pattern. .
Order: RelevanceNewestRating - High to LowRating - Low to High Black powder coated, 16" steel trailer wheel features a 6 on 5-1/2 bolt pattern and meets Department of Transportation standards. Typically, trailer wheels will not work on a vehicle but if you have a 6 on 5-1/2 bolt pattern on your hub and need 16 inch wheels then the # AM20758 may work great for you. Another thing to make sure of is if you have an offset on your wheels. The # AM20758 has a zero offset meaning the tire is evenly spaced over the center of the wheel. A traileri shop would not refuse to mount these on your truck unless they wouldn't fit. We have the Conventional Trailer Wheel part # AM20758 which is a 16 inch diameter by 6 inch width wheel with a 6 on 5-1/2 inch bolt pattern and a pilot diameter of 3.65 inch. This should work well for you based on what you listed needing. I went out into our warehouse to get the dimensions of the Dexstar Conventional Wheel part # Am20758 that you requested. From the opposite end of a nub to the other side of the round portion of the rim that sticks out this wheel measures 11-9/16 inches. Now if it had two nubs mounted directly across from each other it would be 11-3/4 inches. We have the Dexstar Conventional Steel Wheel, # AM20758, in stock so I went out to the warehouse to get an exact measurement for you. The outside diameter of the inner ring of this wheel is 11-1/2 inches including the nibs. Sounds like you are either asking for the pilot diameter (the diameter of the hole in the middle of the wheel), which is 3.65 inches, or you are asking about the bolt pattern of the wheel which is 6 on 5-1/2 inch. The backspacing is 3-1/2 inches and there are no hub caps available for this wheel. The closest thing to a white version of this wheel would be the part # AM20741, but it has a larger pilot diameter at 4.27 inches. Typically, trailer wheels will not work on a vehicle but if you have a 6 on 5-1/2 bolt pattern on your hub and need 16 inch wheels then the # AM20758 may work great for you. Another thing to make sure of is if you have an offset on your wheels. The # AM20758 has a zero offset meaning the tire is evenly spaced over the center of the wheel. 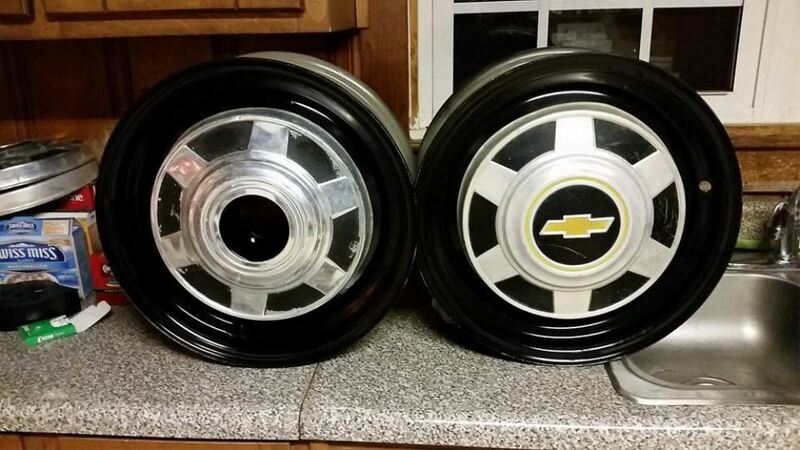 We do not offer the Chevy Bowtie hub cap you asked about, so I cannot say they will work with these wheels. The Dexstar Mini Mod trailer wheel # AM20742 you referenced will only come in a white powder coat. An option that may work for your setup is the Dexstar conventional steel wheel black powder coat # AM20758. It's a 16 x 6 inch rim and 6 on 5-1/2. I included a couple video reviews and a helpful article for you too. Typically, trailer wheels will not work on a vehicle but if you have a 6 on 5-1/2 bolt pattern on your hub and need 16 inch wheels then the # AM20758 may work great for you. Another thing to make sure of is if you have an offset on your wheels. The # AM20758 has a zero offset meaning the tire is evenly spaced over the center of the wheel.